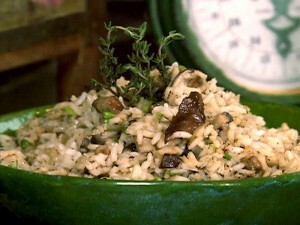 Chicken Mushroom Rice recipe by Nazia Nazar at DesiRecipes.com. Long grain white rice 2 cups. Onion , small, finely chopped 1 no. Garlic cloves, finely chopped 2 nos. Red chilies, seeded and cut into slivers 2 nos. Chicken breast meat, finely chopped 225 gms. Bamboo shoots, chopped or cut into matchstick strips 85 gms. Chinese black mushrooms, dried, soaked for 30 minutes, drained and chopped 8 nos. Shrimps , dried 2 tbsp. Heat oil in a wok, and add onion and garlic . Cook, stirring occasionally, until golden. Add chilies and chicken and stir fry for 2 minutes. Stir in bamboo shoots, mushrooms, dried shrimps , fish sauce and salt . Continue to stir for 2 minutes, then stir in the rice and basil . Serve garnished with basil sprig.